Transport for London (TfL) has refused to run a pro-vegan poster campaign from Peta featuring a severed dog's head on a Christmas platter. The latest controversial campaign from the animal rights group is a proposed poster showing a glazed and roasted dog's head on a platter next to the words: "If You Wouldn't Eat Your Dog, Why Eat a Turkey? Start a New Tradition. Go Vegan." According to Peta (People for the Ethical Treatment of Animals), the poster was due to go live on 100 buses in the capital over Christmas. However, London Buses (a subsidiary of TfL), refused to run them "on the grounds that it may cause offence", PETA said. 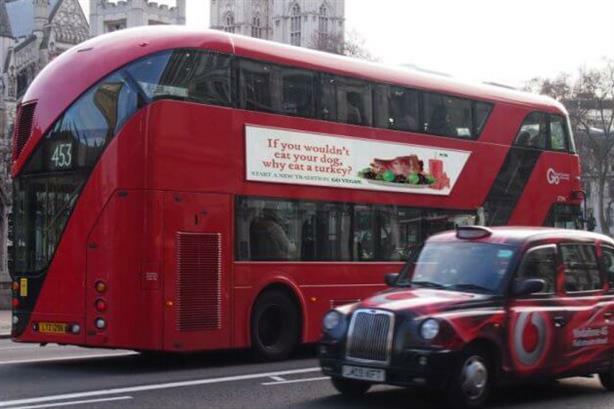 "It's shameful and confusing that PETA's campaign was rejected when Londoners are bombarded with ads selling turkey corpses," said PETA director Elisa Allen. "PETA's ads ask everyone to offer some comfort and joy to all living beings this Christmas by enjoying a festive meal that doesn't have a dead animal's corpse as the centrepiece." A TfL spokesperson said its ad agency, Exterion Media UK, rejected the campaign following advice from the Committee of Advertising Practice (CAP), the organisation which writes the codes for marketing and advertising enforced by the Advertising Standards Authority. The campaign was deemed to have breached the CAP Code, particularly Rule 4.2, which says: "Marketing communications must not cause fear or distress without justifiable reason; if it can be justified, the fear or distress should not be excessive. Marketers must not use a shocking claim or image merely to attract attention." Peta has often caused controversy through its campaigns. Examples in recent years include a leather pop-up store with gory and graphic depictions of animals inside handbags and jackets; and a baby smoking a cigar to highlight the cancer risks of eating meat. However, as PRWeek reported last year in an interview with EVP of marketing and corporate affairs Tracy Reiman, its tactics have softened in general in recent years. "In years past, we felt we had to really shake people at their core, because we needed to grab their attention," Reiman told PRWeek at the time. "It’s hard to do, but today we can grab attention using different methods." Earlier this year, Peta bought shares in LVMH, owner of Louis Vuitton and a number of other luxury brands, allowing it to attend shareholder meetings and question the board. Read next: Which retailers' Christmas campaigns were crackers and which have proved turkeys?